September 9, 2012. 6 Comments. Categories Appetizers, Asian, Dinners on the Go!, Featured, Seafood, Seafood. Tags basil, easy dinner, fast recipes, grilling shrimp, lemon zest, mint, seafood, shrimp, spicy garlic sriracha shrimp, spicy recipes, sriracha sauce. 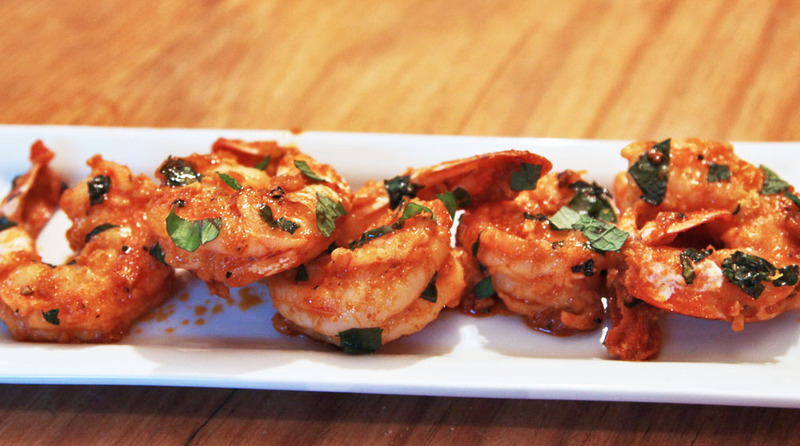 This spicy garlic Sriracha shrimp recipe rocks! I posted it on Babble.com last month and it received rave reviews. Sriracha has so much flavor and spice it compliments fresh shrimp beautifully. I saw a version of this recipe in Bon Appetit magazine. I made a few tweaks but overall it is their recipe. I must warn you though… it’s spicy. So if you are concerned about heat, don’t use as much of the Sriracha sauce or serve a little bit of plain yogurt as a dip and to cool off those sizzling hot shrimp! Place butter and Sriracha sauce in a large stainless steel skillet and stir until butter is melted. Add shrimp and cook for 2-3 minutes (turning shrimp frequently) until shrimp is almost done. Add lemon zest (I usually zest it right over the pan,) mint and basil leaves. Gently toss to coat shrimp in herbs. I love your posts. I need your Hatch Green Chilli Stew recipe. I can’t seem to find on your site. Help. Mmmmm ‘sizzling hot shrimp’ sounds great! I have made this recipe twice – LOVE IT!!! So easy – quick and most certainly, delicious! This was wonderful! I can’t believe how simple it is for such deliciousness! I shared it on my blog with a link back to you. Thanks! You had me at shrimp and then I saw basil AND mint! Yes please…this is going on my menu for next week! Thanks for sharing!